Contributing to this issue: Tony Burns, Michael Ford, Tricia Massella, Fay Jacobs, Doug Yetter, Monica Parr, David Garrett, Barb Ralph, Dan Woog, Kathy Weir, Chris Azzopardi, Dr. Michael Hurd, Terri Schlichenmeyer, and Murray Archibald. 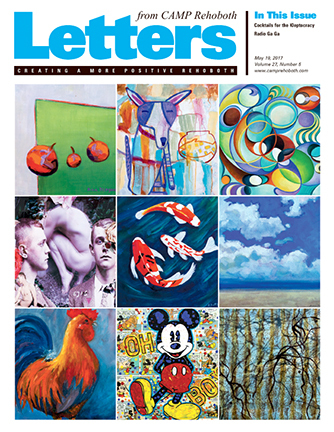 On the cover: Paintings from the 12x12xHeART Exhibit and Auction at CAMP Rehoboth. See In Brief section of this issue for more.